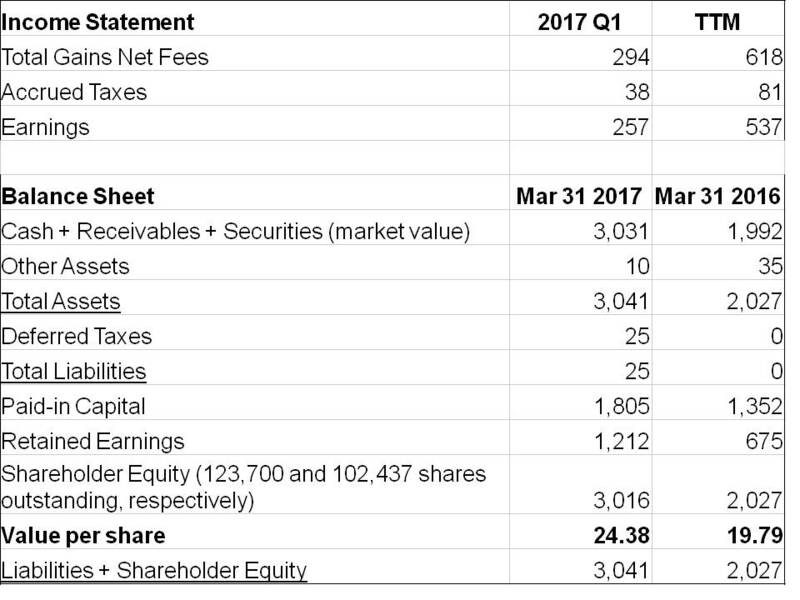 For the first quarter ended March 31st, 2017, KVF gained $2.09 per share, increasing the value of each share to $24.38. It was an excellent quarter from a performance point of view, as this return easily bested all of the indexes I usually quote here. KVF's portfolio benefited from some good luck, as two of its positions announced buyouts at substantial premiums to their previous prices. One I've already discussed, STT Enviro. The other is Immunotec (IMM), which I have not written about because I was still opportunistically adding shares. 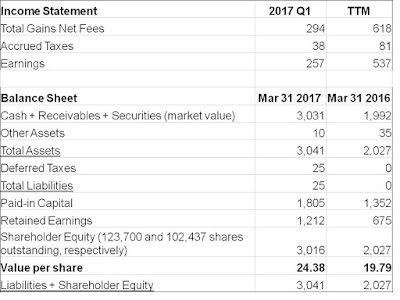 KVF also benefited from the strong share performance of Apple in the quarter, as previously discussed. It was not such a good quarter from the point of view of finding new investments. I have struggled to replace the stocks that have been sold from the portfolio. I want to put cash to work but at the same time I don't want to lower standards as there will likely come a time when Mr. Market will offer better prices. This struggle is not unique to KVF, but where KVF is unique is that its small size provides it with a large opportunity set, and so the onus is on me to continue to uncover value stocks where others can't/won't. Currency headwinds played a tiny role this quarter, reducing quarterly earnings by $0.06 per share. You not posting results any more? They're all posted. Q4 comes out Friday.